Houston Methodist researchers developed a new lab-on-a-chip technology that could quickly screen possible drugs to repair damaged neuron and retinal connections, like what is seen in people with macular degeneration or who've had too much exposure to the glare of electronic screens. In the May 9 issue of Science Advances, researchers led by Houston Methodist Research Institute nanomedicine faculty member Lidong Qin, Ph.D., explain how they created a sophisticated retina cell network on a chip that is modeled after a human's neural network. This will further the quest for finding the right drug to treat such retinal diseases. "Medical treatments have advanced but there is still no perfect drug to cure any one of these diseases. Our device can screen drugs much faster than previous technologies. With the new technology and a few years' effort, the potential to develop a new drug is highly possible," said Qin. 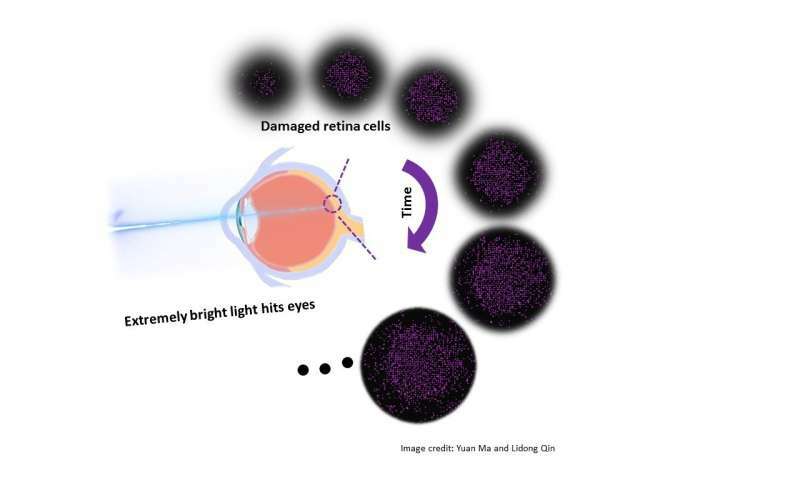 "This so-called 'bystander killing effect' in retina cone photoreceptors leads us to believe that once retina cells are severely damaged, the killing effect will spread to other healthy cells which can cause irrevocable damage," said Qin. "What surprised us was how quickly the killing effect progressed in the experimental model. Damage went from 100 cells to 10, 000 cells in 24 hours." The NN-Chip is an improvement on Qin's BloC-Printing technology, which allowed researchers to print living cells onto any surface in any shape within the confines of a mold. With this latest iteration, Qin's lab loaded and tested cells with micro-needles in an open dish so they could tailor the neural network device, study individual cells as well as the progression of drugs through the platform's many channels. Microfluidics focuses on the behavior of fluids through micro-channels, as well as the technology of manufacturing micro devices containing chambers and tunnels to house fluids. In addition to the BloC-Printing chip, Qin's lab at Houston Methodist also successfully developed a nonconventional lab-on-a-chip technology called the V-Chip for point-of-care diagnostics, making it possible to bring tests to the bedside, remote areas, and other types of point-of-care needs.